If this October finds you “with child”, congrats! There are tons of Halloween costumes for pregnant women, so it’s just a matter of finding the one that fits you (and your belly) best. Maternity costumes generally come in two types; the kind of costume for pregnancy (made especially for pregnant women), or costumes that just happen to work really well when you have a bun in the oven. 2008 was the first year that an entire new line of specialty maternity costumes were released, with more coming every year! If you want more variety look for costumes with open waists that cinch with a belt or a high empire waist. Thankfully many Halloween costumes have one of these two forgiving waist styles, and we’ve featured the best of them below. 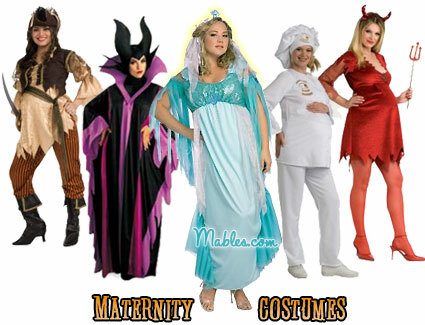 We’ve hand chosen all of these unique maternity Halloween costume ideas just for you and the new arrival. High quality costume has a long satin gown in a deep green/blue color with sparkling two-tone shimmer fabric detail and sleeves and an empire waist, plus molded snake headpiece and snake necklace, both with jewel accents. Includes sequin dress and belt. Plus size 18-22. Shoes and Officially licensed Hairspray product. A practically perfect costume that customers rate 5 stars for it’s flattering anc comfortable cut. Includes a velveteen black coat with attached blouse and skirt, hat, and a functional flower handbag. This tart little cutie has a hat and body suit made out of a light weight foam, which is super comfortable. High quality costume has a long satin, empire waist gown in a deep green/blue color with sparkling two-tone shimmer fabric detail and sleeves, plus molded snake headpiece and snake necklace, both with jewel accents. So cute on its own or as a Halloween costume for pregnant woman. Comes with Pea Pod bodysuit with pockets for green “pea” balloons. The balloons are included, too. Beautiful water-blue silky gown fades to cream on top with gold accents and cut-away flowing sleeves. Runs small so it also makes a gorgeous maternity costume. Customers love this yellow Peep-shaped costume and rate it 5 stars for cuteness and comfort. Great for Easter, Halloween, or costume for pregnancy. Costume includes two-toned purple & black empire waist dress with draped sleeves and separate stand up collar. Also makes a good renaissance or maternity costume. Customers love this renaissance costume and rate it 5 stars for a flattering cut and high quality. A lovely floor length, empire waist purple and ivory panne gown with gold trim accents and a matching headpiece. Fun costume comes complete with gold lame dress, hat with attached braids, and boot covers. Customers love it and rate it 5 stars. This couples costume has somehow become sort of popular. This fabric and foam contraption makes for easy walking and dancing, but there are much more clever costumes out there. Works well for pregnant couples as a maternity costume, though. This magnificent costume includes a long flowing black dress with 2 shades of purple accents, attached foam stand-up collar and foam headpiece. Customers rate it 5 stars for its high quality! Okaaaay. If you dream all year about being a plate of greasy breakfast, this is the perfect costume for you and your partner. But if you need Halloween costume ideas for pregnant women, look no further than the fried egg! What a fruity costume idea. Includes a super comfy one-piece, over-the-head foam costume. Barrel Of Monkeys costumes includes barrel, headpiece, and two monkey hand puppets. The Bun In The Oven costume includes a tunic shaped like an oven and a bun that can be put in the oven. Very sheer long-sleeved, black, knee-length, layered dress. Add wings and any whimsical details you like for a gorgeously gothic fairy costume. Very sheer empire waist purple/pink layered, jagged-edged, knee-length dress. Includes a black satiny dress with a sparkling overlay, a satin ribbon along the drop waist, and a skirt section with shimmering fringes. A long pearl necklace and coordinating cloche hat, with satin ribbon and rosebud detail are also included. Costume includes Dress, headband, and leggings. A battery operated switch that you hold in your hand lets you set off your heart-o-meter when you smooch the person of your dreams! Includes a foam “booth” with light up hearts and red sequin straps, light up heart shaped headpiece and arm garter for collecting your dollars. Customers rate it 5 stars! Costume includes Shirt with attached vest and sash, pants with attached boot tops and hat. Comfy one piece blue with white polk-a-dot dress and white apron, white bloomers, striped socks and a cap with attached wig. This fun tropical costume includes hat, tunic, fruit wedge and straw. Customers rate it 5 stars for quality and comfort. This “Roaring Twenties” costume includes a black layered-fringe dress with sequin trim and matching sequin headband with black feather accent. Customers love this flattering and quality made costume and gave it wonderful reviews. Soft fleece blanket covered in little piggies! Customers love this silly costume and rate it 5 stars. Purple gown with attached black cape, cord sash, and a hood with an attached collar and a crown. Check out the awesome customer submitted photos! Costume includes Oven. Does not include shirt or pants. Includes a blue satin dress with attached apron and a black headband. Available in Plus size 18-22. Metallic black empire waist dress with an attached gold belt, classic witch hat, and black/green striped knee high socks. Devilicious Diva includes top, skirt, and horns. Womens plus size, 16-20. Includes a black crushed velvet dress, arm bands with veil and headpiece. Available in size Plus. Costume includes Jacket, pants and hat. Costume includes Dress, bloomers, hat and stockings. Satin dress with rosettes and sheer accents, and lovely headband with matching rosettes. High customer reviews on this gorgeous force of nature! Runs small, so might make a good maternity costume. Blue-green dress with seashell accents and sheer detailing, and whimsical mermaid headpiece. Runs small so it also makes a good maternity costume. This costume includes full length tunic with collar and foam headpiece. Costume includes Dress and horns. Pitchfork and . The costume includes: apple tunic with brown worm exiting from it. Our costume includes a regal Green/Turquoise gown with lace-up bodice and flowing purple inset, hanging-style sleeves with gold trim, gold choker, and matching headpiece. The color of the dress may vary slightly from shown. Costume includes Dress with brooch and horns. Costume includes Dress, badge and hat. eBay actually has some rad deals and unique ideas for Maternity Costumes. See? If you don’t have a free eBay account, you can register here.